Said to have existed for over 4,000 years, there are many schools, approaches, methods, and even needle types, of acupuncture. At ENERGY ROOM, the greatest importance is places on the “ki(chi),”“meridians,” and “meridian points”. Ki(Chi) is a form of energy that exists within the bodies of all living form, and Eastern medicine is based on the concept that both ki(chi) and blood continuously flows throughout the human body. Just like blood flows through the arteries and veins, ki(chi) flows through the meridians. If the 2 flows are smooth and balanced, then the housing body is in good health. Meridians spread out just like veins and arteries throughout the body, and not only are meridians pathways for the ki(chi), they also possess important “points” that can regulate the flow of the ki(chi), called meridian points. 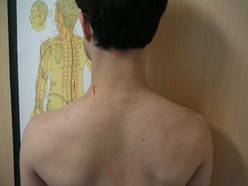 These meridian points, also called “acupuncture points,” when stimulated by needles, have the effect of enhancing the flow of ki(chi) within the relevant meridian(s). Just as encouraging the blood flow of the circulatory system does a human body good, enhancing the ki(chi) flow does a human body good. In a healthy state, one’s blood flows from the top of the head down to the tips of toes smoothly without stagnation, and in such a bodily state, ki(chi) is also flowing smooth and strong. As massaging stimulates the arteries and veins and therefore encourages the blood to flow more smoothly, Acupuncture stimulation on the meridian points encourages the ki(chi) to flow more smoothly throughout the body, and to become balanced as a whole. This is the essence of acupuncture therapy here at ENERGY ROOM. By “balancing and fixing” the ki(chi) flow through acupuncture therapy in the above way, one can experience the “wonders and mysteries of the Eastern healing art of acupuncture”! “Oddly enough, I actually am incredibly better,” “I feel euphorically-energized,” “The painful area feels much better, though the acupuncture needles never touched that site,” are actual comments made after an acupuncture therapy session. Although some ailments can indeed be “instantly and magically healed” by acupuncture, the best timing to receive acupuncture therapy, contrary to many common misunderstandings, is when one has no physical problems or pain. Even in such situations, the chances are that the body stores some kind of stress, tension, or imbalance, and this is the very timing when one can get the bodily ki(chi) energy balanced out in order to prevent anything to turn for the worse. Eastern medicine, acupuncture included, is after all, preventative medicine, at heart. Since these meridian points exist rather on the surface of the human body, it is NOT necessary to penetrate the needles in too deep under the skin. The act of skin penetration itself, though maybe not too significantly, is a form of damage and stress to the body. 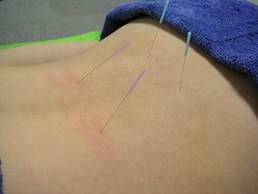 From this “Fewer the needles, the better” standpoint, the acupuncture therapy performed at ENERGY ROOM uses no more than 8, typically only 4 or 5 needles. Therefore, if you are seeking an acupuncture method that “Sticks numerous needles quite deep and gives the body a ‘Needle-Kick’ shock/high,” or “Penetrates needles deep into the muscles and/or hitting the nerve,” or “connecting pulse electrodes onto the needles stuck into the human body,” then the acupuncture method offered here at ENERGY ROOM is probably not for you. If you are seeking to feel the “important effective points”, then you might be pleasantly impressed! Acupuncture therapy can be received by itself or in combination with our Kenbiki therapy, at ENERGY ROOM. 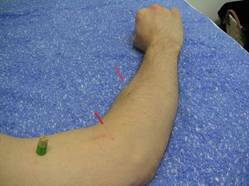 HOW HYGENIC ARE THE ACUPUNCTURE NEEDLES?